The Taurus® 800 Series matches an incredible rate of fire with the exclusive Taurus "Strike Two" trigger system for industry leading reliability that gives you a potentially life saving second change that striking a faulting round. The extreme-duty, next generation handgun, created for Special Operations Personnel, incorporates only the highest quality materials, craftsmanship and manufacturing tolerance for remarkable accuracy and ruggedness. New features include unique take down levers for a quick fi eld stripping, a lanyard loop and an external hammer as requested by our valuable customers. 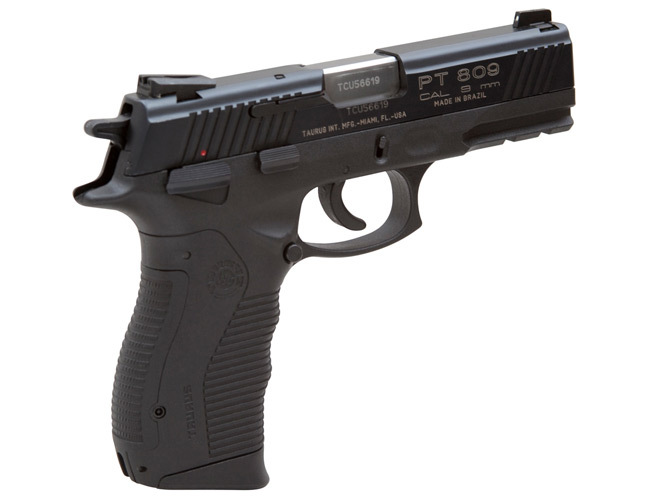 Taurus PT 800 Series pistols were designed with end user collaboration so as to satisfy the most rigorous firearm acceptance tests for Law Enforcement and military use. These fi rearms were designed to be fully ambidextrous, with easy and intuitive use. The trigger system and double action hammer system are reminiscent of the widely known Brazilian police forces' traditional operation concepts. The PT 800 series pistols confer a sense of reliability and security in open or discreet use, for those in need of a modern semi-automatic pistol.